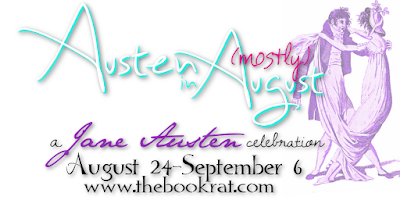 The Book Rat: GIVEAWAY: Hand Lettered & Painted Jane Austen Quotes! GIVEAWAY: Hand Lettered & Painted Jane Austen Quotes! It's safe to say, it's a bit of an obsession. I've put together a few of my favorite, most Pinterest-worthy short Austen phrases + simple watercolor floral wreaths, for this year's artsy giveaway, and now is your chance to win one! And because I've always felt like "sharing" a giveaway is counterproductive to a lot of people (after all, if I share it, that means more entries, which means less a chance for me to win), the more entries this gets, the more of these I'll make and give away. And maybe I'll whip up some of those hand-lettered actual book pages I was telling you about, too! These are NOT prints. They are directly lettered and painted onto Canson 140lb watercolor paper by me (within the last week or so, in fact! ), so if you don't post it up somewhere, make sure to store it properly -- if it gets wet, the paint may well reactivate and run! Watercolor quotes are standard 5 x 7. Book pages are similar, but slightly irregular (having been cut out of a book, and all that). Do you have a preference for which quote you win? Or is there another short quote you'd like to see in the giveaway? Let me know in the comments! Sneaky Cat says Good Luck!! I have so many quotes that I love. So, I will leave this up to you. Although, one of my favorites is "Happiness in marriage is entirely a matter of chance". These are beautiful Misty! Love your watercolour work! Know your own happiness would be a great reminder to hang up at my house. They are lovely, very beautiful! I really like them all and the ones on the links. I love the flowers but a quote came to mind that I believe it will be a funny watercolour: "reading one book is like eating a potato chip" by Diane Duane, what do you think? By the way, thank you for doing the giveaway. Wow, those are so creative and lovely and wonderfully artsy! Also, in that last picture, I really hope the water color was dry before the cat put their paw down, haha. No preference; I love these. Just so beautiful. These are beautiful Misty! And your cat is super cute! I'm also a fan of "Till this moment, I never knew myself" and "Think only of the past as its remembrance gives you pleasure" from P&P, and "If I loved you less, I might be able to talk about it more" from Emma. And of course there are a bunch of longer quotes that would not fit onto a watercolour page, lol (such as the famous "truth universally acknowledged" one). Thanks so much for the giveaway, Misty -- those watercolours are absolutely gorgeous!! So beautiful!!! I love calligraphy. Love these! Of the ones you displayed, my favorite is "My heart is, and always will be, yours" -- thanks for the chance to win! This is just lovely. Honestly, amazing work. I'm from Brazil and I love your blog with all my heart. <3 My favourite quote is “If adventures will not befall a young lady in her own village, she must seek them abroad.” of Northanger Abbey!